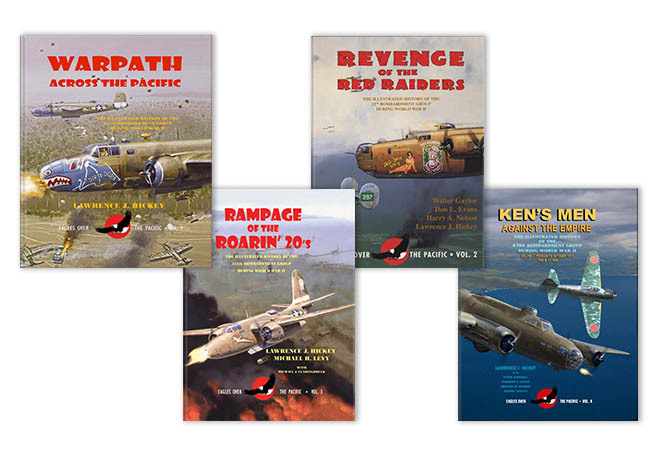 First published on this blog in September 2014, we thought it was time to bring the story of a Japanese raid on the 22nd Bomb Group back to the front page. For three days, the 22nd Bomb Group had been in standby mode at Seven Mile Drome as they waited for their next big mission. Each B-26 was loaded with six 500-pound bombs, fueled and parked in the open, as revetments had not yet been built. The ten crews were camped out next to their planes, ready to move at a moment’s notice. During the last couple of months, the Japanese had been keeping an eye on the situation in New Guinea and decided it was about time to improve their prospects there. They decided to move troops and artillery from Rabaul to Buna, and would need a distraction for a successful move. This distraction would come in the form of an air raid on Seven Mile on August 17, 1942. That morning, Capt. Gammon heard that a Japanese raid was imminent. He ran to his plane, calling to Bauman to start the engines and get ready for an immediate take off. Three bursts from an antiaircraft gun were heard, signaling a red alert. Their early warning system failed and caught everyone completely off guard. As the men scattered, 24 “Betty” bombers in perfect formation approached the airfield at 20,000 feet. Puffs from antiaircraft fire dotted the sky, but were too low to hit the incoming Japanese. Gammon climbed aboard his plane and headed for the runway with a small crew. As he took off, bombs fell all around his plane, exploding violently, and sending shrapnel into the aircraft. Some of the pieces landed on the bombs in the bomb bay. Quickly, Bauman released the bombs in order to keep the aircraft in one piece. Gammon kept close to the hills to avoid drawing any attention from the Japanese, then circled the runway until the debris was cleared and it was safe to land. He eventually landed with 200 holes in his plane and a shot-up right tire. When the red alert sounded, Capt. Gerald Crosson was taxiing to the runway with a full crew. He was about halfway down the runway when the bombs began falling and one exploded about 20 feet in front of his B-26’s left wing. As flames from the explosion engulfed the plane and crept towards the bomb bay, the crew abandoned the aircraft as quickly as they could before the bombs exploded. The co-pilot, RAAF Sgt.-PIlot Logan, had been incapacitated by the explosion, so Crosson stayed back to pull him from the bomber. Just as Crosson and Logan took shelter in a crater from one of the bombs, the bombs in the plane blew up. The two men were helplessly caught in flames and a shockwave from the blast. Once the raid ended, Logan and Crosson were loaded into an ambulance. Logan did not survive the journey to the hospital. After the raid was over, the 22nd tallied their losses. The message from MacArthur’s office about the raid minimized the results of the surprise attack. 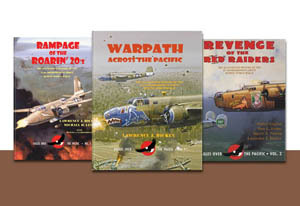 One report listed four of their planes as destroyed, as well as three from other groups, and 25 damaged. Pieces of planes, clothes, guns and much more littered the airfield. 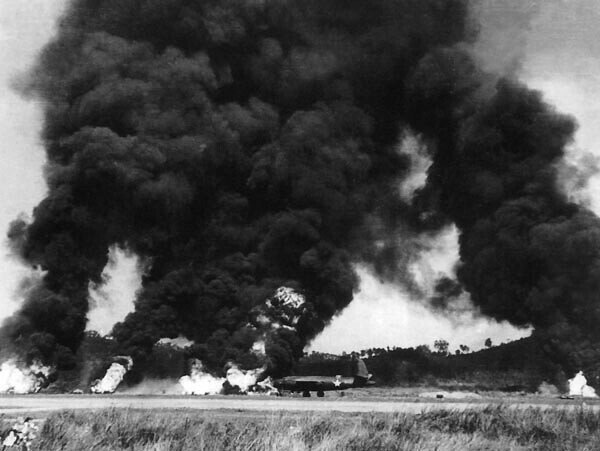 One thousand barrels of gas and oil burned at one end of the runway, sending plumes of smoke 1500 feet in the air. The Group lost its tower and Operations shack in the raid. The spot where Gammon’s plane had been parked was turned into a giant crater five feet deep and 15 feet wide. For the next 24 hours during the cleanup, delayed action bombs would explode every four or five minutes. Throughout World War II, the subject of food was regularly brought up, usually because it was so terrible and the occasional good meal was worth writing home about. While the 43rd Bomb Group was staying in Port Moresby, they put up with field rations that included canned mutton, powdered eggs and “corn willy,” which was Aussie slang for canned corn beef. Obviously, visits to the mess hall left much to be desired. There was one chef in the 403rd Bomb Squadron who decided to have a little fun with the menus each day and began writing up items such as “Spam ala King,” “Spam Peking,” “Sweet and Sour Spam,” etc. One day, he ran out of ideas and wrote “Just Plain Ole Hairy Spam.” We do not know if scenes similar to Monty Python’s Spam skit played out in the mess hall. The men grew tired of the bad-tasting, nutritionally-deficient food they had to eat every day and it also lowered their morale. Before long, unit mess officers started up programs to ferry fresh food from northern Australia. Men would contribute money to a fund that would go towards purchasing fruit and vegetables as well as fresh meat, dairy and eggs. Planes typically used for these trips had been designated as war-weary and removed from combat service. They were often known as “fat cats,” possibly adopted from an early 3rd Bomb Group B-25 called Fat Cat that was repurposed as a ferrying aircraft in late June 1943. Unlike most trips, the plane returning from Australia this time was a brand new radar-equipped B-24 carrying supplies and fresh food such as a side of beef, watermelons and cases of eggs. As the plane touched down at Seven Mile Airdrome, the left tire blew out, causing the B-24 to swerve to the left. Pilot F/O Clarence Molder did his best to straighten out the landing by applying the right break and increasing the power to the left outboard engine, but to no avail. It finally came to a stop in a ditch, with the nose twisting and the outboard props being torn away. Luckily, the aircraft did not catch fire. 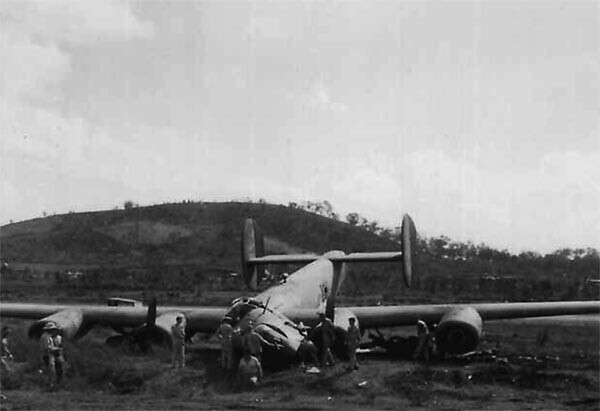 The B-24 after it stopped in the ditch. Before the landing went awry, radio operator T/Sgt. Charles G. Meinke had been sitting on the floor with one foot on a case of eggs. After the crash, he feared he was injured and bleeding when his foot was forced through the case and he felt liquid in his shoe. It turned out that he was not seriously injured, but the eggs had broken and the yolks had seeped into his shoe. Second Lieutenant John P. Harmon scrambled out of the plane and noticed fuel leaking from a ruptured wing tank and another stream that was running onto a hot turbocharger. The turbocharger was so hot that it vaporized the gas as it poured down. Harmon ran for the fire extinguisher to cool down the turbocharger, then took the emergency axe to rescue his crew members still trapped inside. Several of the other men finally got out through the plane’s windshield and helped Harmon until crash trucks and ambulance crews arrived. To the joy of the onlookers that had gathered, they soon freed the rest of the crew. As happy as the men were to see the crew make it out alive, a 501st Squadron Adjutant was upset to see his large purchase of fresh food littering the runway.